A well designed and cared for landscape is a work of art. It is an enduring investment, a place to express and accentuate our clients’ individuality and the essence of their home. Through the thoughtful consideration of your property, and with vast experience of Martha’s Vineyard’s native plants and habitats, Oakleaf Landscape and Nursery offers elegant, functional solutions that are appropriate for you and your estate. Our belief is that a well designed and cared for landscape is a work of art. A well designed and cared for landscape is a work of art. It is an enduring investment, a place to express and accentuate our clients’ individuality and the essence of their home. Through thoughtful consideration of your property, and with vast experience of Martha’s Vineyard’s native plants and habitats, we offer elegant, functional solutions that are appropriate for you and your estate. Oakleaf owns it’s own Nursery in West Tisbury. This gives you an exclusive relationship with the best, full-service nursery on Martha’s Vineyard, providing you access to exceptional materials. We grow our own vegetables and herbs locally and organically, keeping plants and materials available throughout the year. We can even special order the most unusual request. Come pick out the best stock on the island. 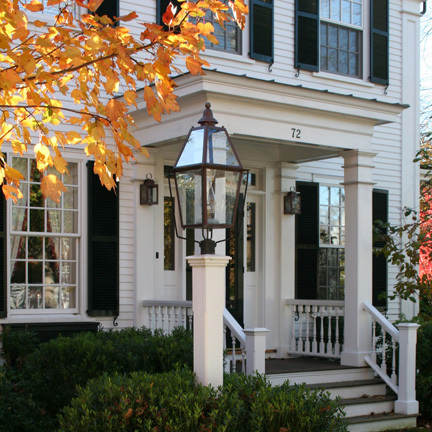 Lamplighter Corner was established in 1967 when Hollis Fisher made the first reproduction of the Edgartown street lamp. This lamp was one of several historic models that lighted the town between 1869 and 1912. In 2005 Lamplighter Corner moved up-island and is now located at Oakleaf Nursery in West Tisbury. Our authentic reproductions, as well as custom designs continue to be hand-crafted by artisan Billy Hoff. Oakleaf Landscape, Oakleaf Nursery, and Lamplighter Corner take pride in helping you create and maintain the Martha’s Vineyard property of your dreams.